Well....we are back to work. No sand and sun for Barb and me today. We've had lots of rain. My grass is growing and everything here is GREEN. As we drove through St. Louis I happened to look up and noticed that we were on Hwy. 21. I said, "Barb I think we need Hwy 64 not 21." Barb replied, "Well, this is a short cut." "Are you that familiar with this area of St. Louis?" I asked. As we turned into the parking area of an Antique Mall I realized what kind of "short cut" she meant. (She's a very bad girl!!!) Two hours later we were back on the "right" road. I can't take my eyes off the road if she's driving. 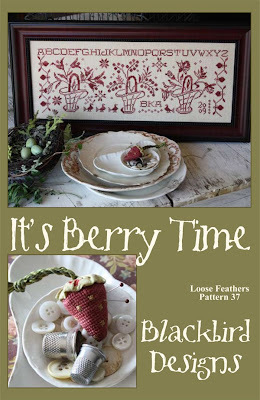 We have shipped out the next Loose feather pattern to the distributors. Thought you might want a sneak peak of the cover. It will be in your local shop sometime in the next two weeks. 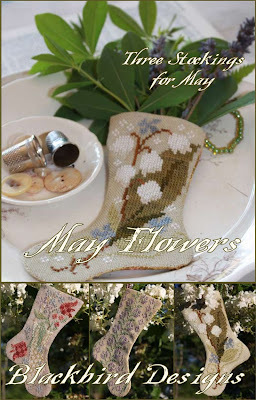 Also I need to let you know about a correction needed on our May Stocking pattern. The Lily of the Valley needs a color correction. I have reversed the symbols for Snowball and Shaker White. Snowball should be an open circle. Shaker White should be a solid half circle. When you look at the picture of the stocking you will note that the darker color (Shaker White) is on the bottom portion of the small bell flower. The lighter color will be on top of the small bell flower. The random motifs in the stocking are the lighter Snowball color too. I'm very sorry for the error! We missed this one in the proofing of the pattern. I love friends who drive me down the 'RIGHT' road. Way too much fun. And, I love the new Loose Feathers design. It's simply a must have. Thanks for keeping my fingers as busy as ever and my heart as happy as ever!! I can't wait to get the new book. I am going to return to the world of cross stitch because of you. I love the new Loose Feathers chart!! Can't wait to stitch that one and I already know where I'm going to hang it when it's done! That new Loose Feathers looks fantastic! Definitely a must have. Thanks for sharing your creativity with us. Love the new Loose Feathers! It's perfect!! Oh man, another must have!! You gals are too freakin' creative. I love it. You have such Great Trips Together...reminds me of "Thelma & Louise"..lol.. I know exactly where that Antique Mall is on Hwy 21. We past it every time we go to my son's house. Beautiful, beautiful, beautiful! Love your new Loose Feathers. Can't wait to get mine. Anything to 'show & tell' from the Antique Mall? If we would have known you were so close we could have given you a call to meet us. It's a great antique mall. We loved it! Do you stop when you visit your son? Thanks for letting us the correction too! reading a new post over your blog is like a good wish for the new day: thank you! I think Barb was perfectly correct -- you all needed one last stop before getting home! :D Nice Loose Feathers design too -- I so love collecting these! Hopefully I'll get them stitched too! lol! I love her kind of "short cut"! Can't wait for the new LF! Thanks for the preview, Alma! ohhhh an antique mall?! she is a bad girl! lol .. sooo what goodies do you find??? I am anxious to get my hands on your latest release...great job as always! LOvely designs. YOu are so talented. I'm going to add a little layer by saying thank you for this blog both fun and smart. It is a pleasure to come and sail there.